I work with many runners in our clinic. I often see restrictions in the soleus. While the running community is warming up to soft tissue mobilization, many runners are still resistant to embrace it routinely and engage in it more so only when they are hurt or lacking flexibility. STM (soft tissue mobilization) should be part of every runner’s maintenance program. Why? Simply put, repetitive stress takes its toll on the body. 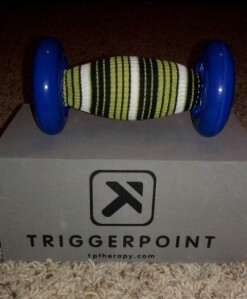 Rolling or releasing the tissue increases blood flow, eliminates trigger points, and facilitates optimal soft tissue mobility and range of motion. 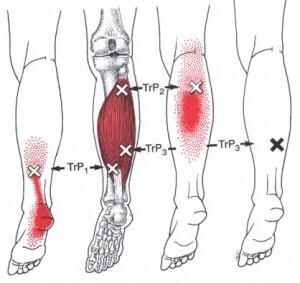 In the diagram below, you can see common trigger points in the soleus. The X represents the trigger point & the red shaded area is the referred pain caused by the trigger point. In the case of the soleus, restricted dorsiflexion could lead to other biomechanical compensations with running. Initially, this often creates a dysfunctional and non-painful (DN) pattern. Over time, this may eventually become a dysfunctional and painful (DP) pattern forcing runners to seek medical care. The terms DN and DP come from Gray Cook’s Selective Functional Movement Assessment (SFMA). As such, restoring mobility is important. A recent study revealed that immediate improvement in ankle motion can be attained with just a single treatment (click here for the abstract).